Mackintosh skilfully uses colour on the facade, combined with sculpted sandstone and white glazed bricks to maximise light. 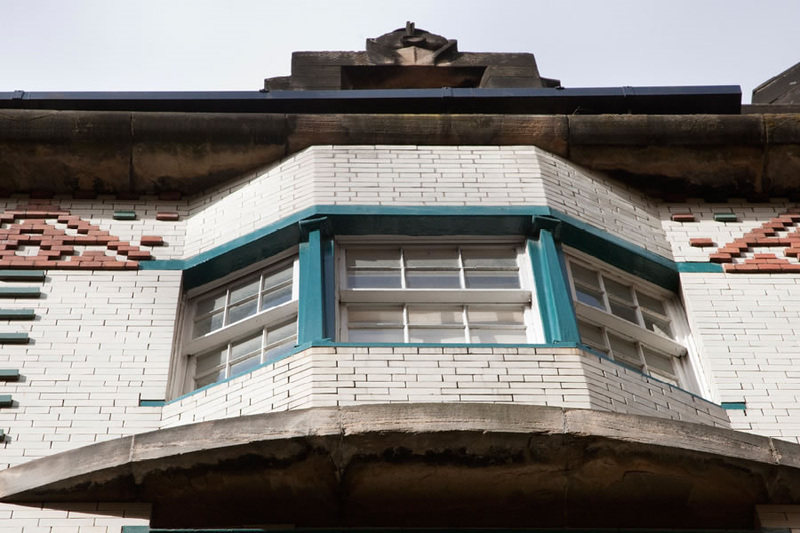 The individuality of the detailing and the use of materials in the main elevation point unmistakably to Mackintosh. The perspective drawing exhibited at the 1901 Glasgow International Exhibition is drawn and signed by him. The building was built in two distinct phases. From May 1900 to May 1901: the basement, ground, first and second floors across the entire building were constructed; the upper three floors of the west section followed between October 1903 and May 1904. Newspaper production began following completion of the first phase. John Honeyman & Keppie’s drawings submitted to Glasgow Dean of Guild Court in April 1900 – signed by John Keppie but probably drawn by Mackintosh – show that the upper three floors were initially intended as warehouse, i.e. storage, spaces. The Stereo café is now open for business on the ground floor enabling visitors to sit and savour this long neglected treasure. Currently, there is no admission information for this attraction.